Jerry cans, drums, intermediate bulk containers (IBCs)—you can use our DrumQuik® dispensing systems on virtually any container for safe, “closed” extraction of chemical or food-based fluids. With several dip-tube based systems of different sizes and materials, our solutions minimize the potential for potentially dangerous exposure while protecting your fluids themselves from contamination. In many industries and applications, food products, chemicals or other liquids are poured or pumped directly out of open shipping containers. 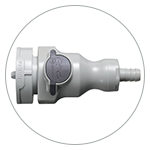 These open or semi-closed dispensing systems are susceptible to contamination, spillage, waste and noxious vapor release. Often end usrs have to figure out how to transfer the liquid from the container to their process system. As a result, personnel, equipment and the environment can be needlessly exposed to hazardous chemicals and the fumes they generate, and the media itself is susceptible to contamination. CPC’s DrumQuik® Dispensing Systems provide packagers a “ready to dispense” container that is safe and easy for their customers to connect. 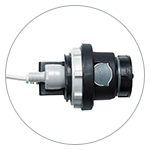 DrumQuik® systems allow you to convert almost any open dispensing system to a closed dispensing system, protecting workers, the environment and container contents. It’s the safer, simpler, quicker dispensing solution. A closed dispensing system is designed to minimize exposure to chemicals or liquid consumables during transport, dispensing and disposal. 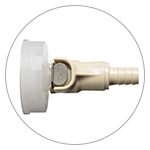 CPC’s DrumQuik® Closed Dispensing Systems incorporate an integrated closure (bung plug) and dip-tube assembly that eliminates the need to remove and re-install the dip tube at point-of-use. This makes closed dispensing possible. In addition, the drum insert assembly can be reused, but it is so cost effective it can be treated as part of a single-trip disposable package. 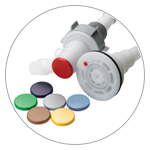 CPC’s DrumQuik® PRO Dispensing Systems simplify transport and dispensing of this urea-based DEF. What’s more, DrumQuik® PRO allows the DEF packager or distributor to ship a 100% sealed container to the station or dispensing site without the risk of contamination, and the low-cost, integrated quick connect dip-tube system makes connection easy for station or site managers. 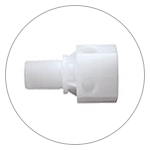 CLOSED*: Dip tube is installed in the container at the packager, not at the end-user site. The pump is connected via a sealed coupler onsite. * The definition of "closed" is typically derived from FIFRA standards, which define the requirements for returnable/refillable containers used for Ag chemicals under the applicable EPA standard 40 CFR part 165 (Protection of the Environment) Paragraph 45e, which states "each opening of the container other than a vent must have a one-way valve (check valve), a tamper-evident device or both." Both OPEN and CLOSED systems are approved for use in DEF applications. A typical closed system will involve installing a dip tube or "drum insert" at the DEF packaging facility. 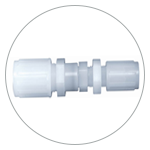 This dip tube travels with the container to the end-user facility. 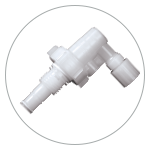 A coupler or "dispense head" is then connected onsite to the dip tube for easy dispensing. 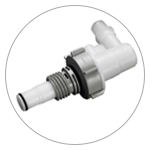 In this type of closed system, a shipping plug seals the dip tube during transport and disposal. Bioprocessing manufacturers require extremely high-purity chemicals and chemical dispensing methods. A closed dispensing system is critical if you want to prevent infiltration of impurities into these processes. Bioprocessing applications also have very rigid requirements for the purity of base resins and material handling and packaging of any product used to transfer chemicals. Industrial and commercial laundry facilities use thousands of gallons of detergents, softeners and bleach every day. CPC’s DrumQuik® Dispensing Systems are designed to make these facilities cleaner and safer for both laundry workers and the environment.